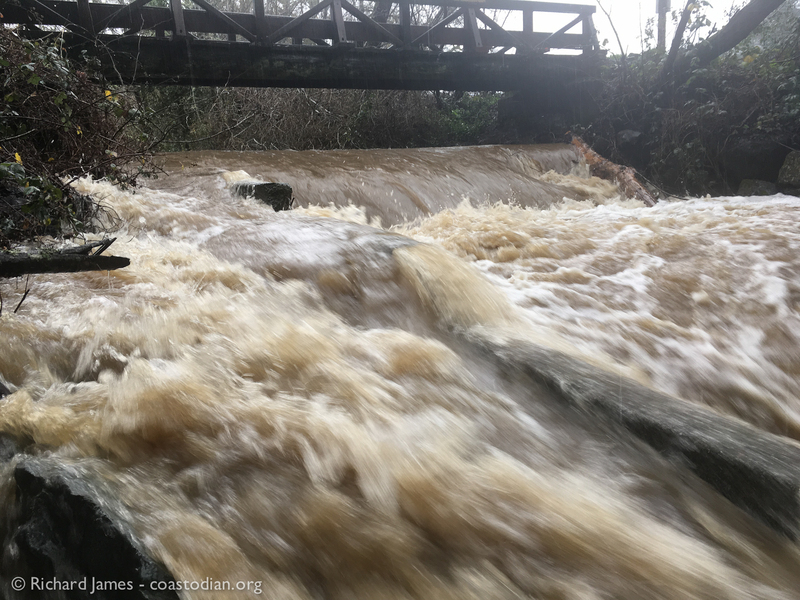 Click on the words above “Coho salmon return to Lagunitas Creek to spawn” to see this entire post. 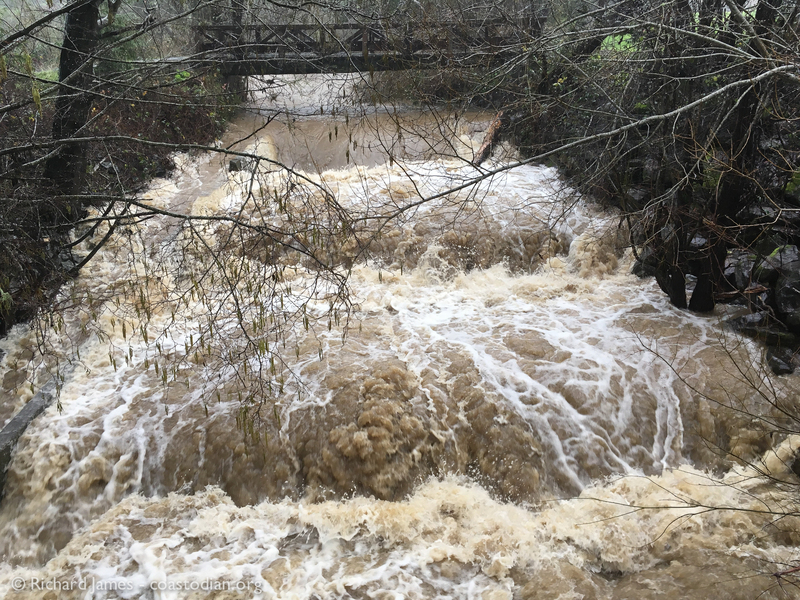 It rained really hard the past two days, enough to raise the level of local creeks permitting the return of our beloved Coho Salmon to complete the next phase of their journey, spawning. 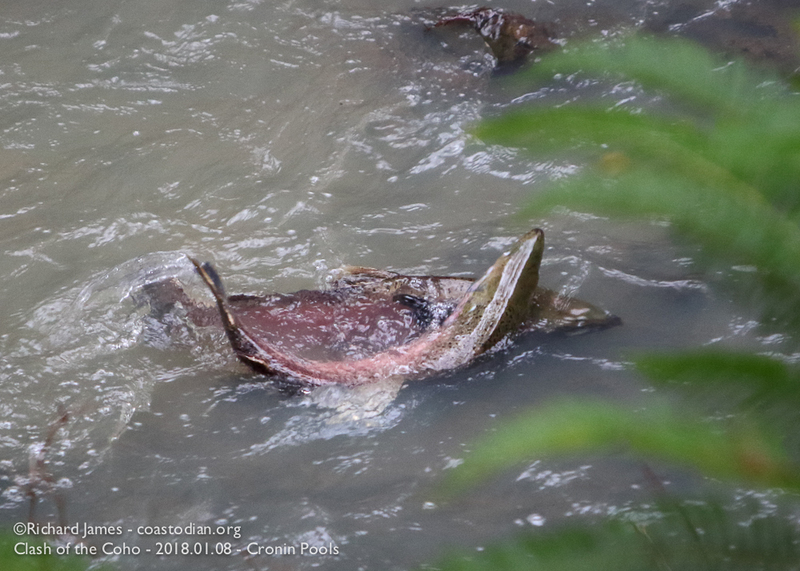 The following still images show what are likely two very large male salmon jousting to assert dominance in order to determine which of them will spawn with the nearby females. 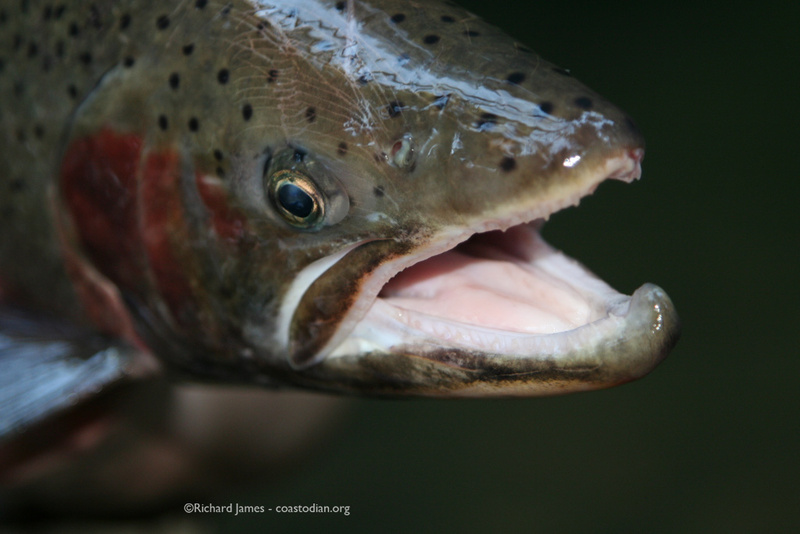 If you go out to see the salmon, and I strongly encourage you to do so, please observe a few simple suggestions to ensure the fish are not disturbed and you are comfortable. Wear warm clothing with layers, ideally in muted colors to blend in with the greens and browns alongside the creek. Wear rubber boots or sturdy hiking shoes. Keep your voices down, the fish can hear you. Be patient as you walk along the creek and you will see the magic of these fish returning to the creek where they likely hatched 3 years ago, to lay eggs, fertilize them, then die. 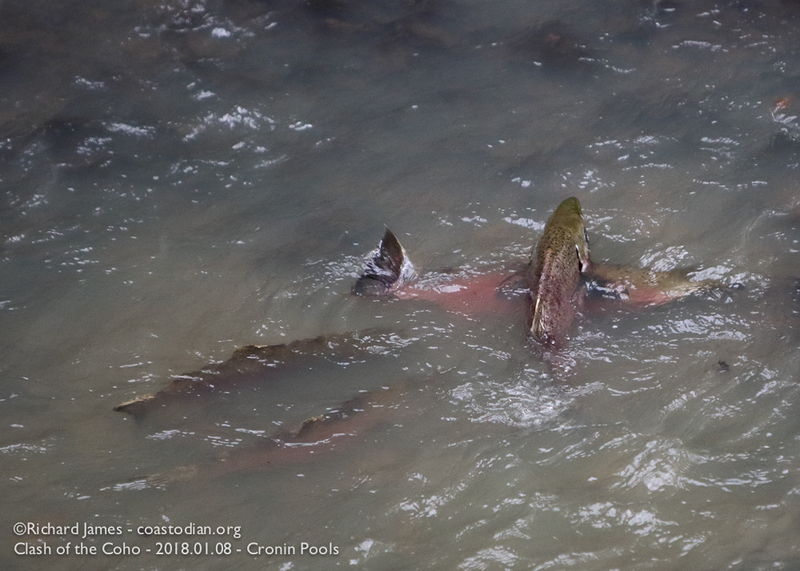 The best places to easily view spawning coho are the Leo T. Cronin viewing pools in Samuel Taylor Park, Devils Gulch, both on Sir Francis Drake Blvd. 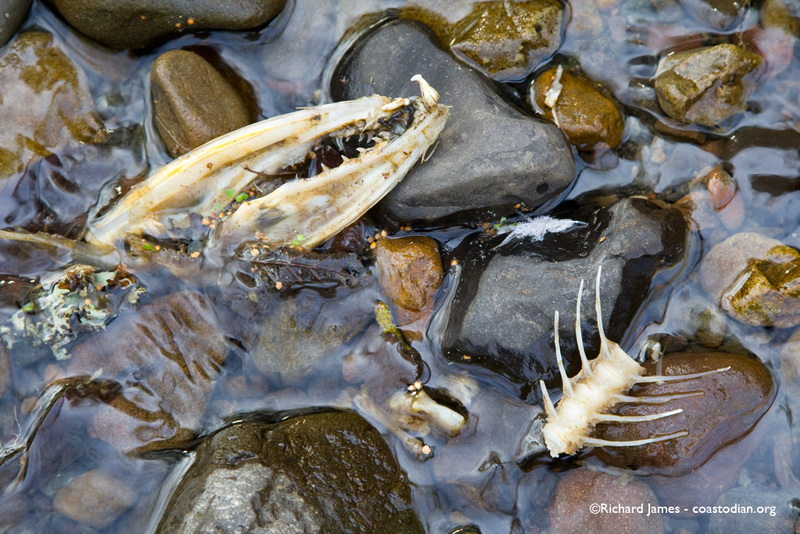 Be sure to wait a day or two after heavy rains to let the silt settle so you can clearly see the fish. 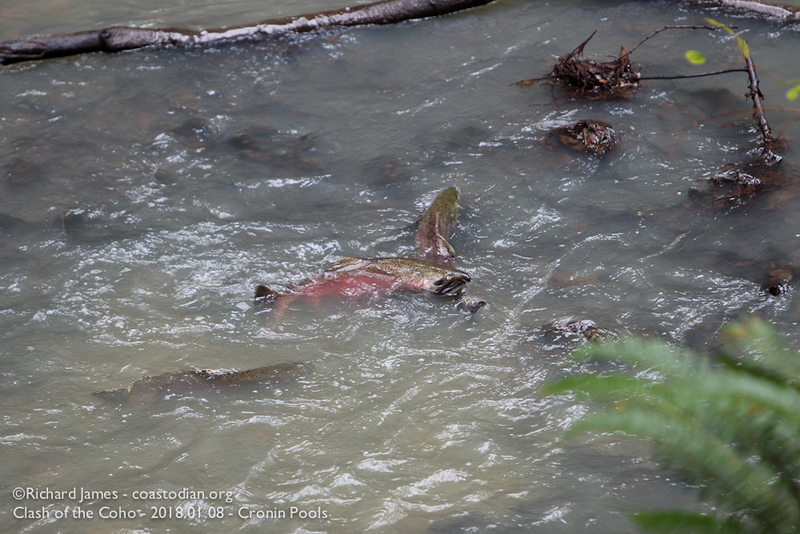 For similar amazing footage of coho spawning on Lagunitas, go here. 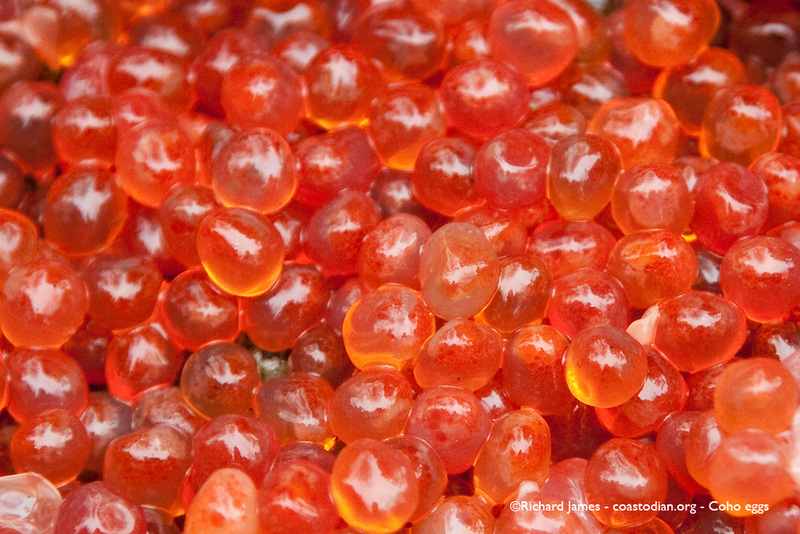 Stop the pebble mine in Bristol Bay Alaska – save Alaska’s greatest sockeye salmon run, go here. If you have a large screen, click the white rectangle-ish shaped icon to fill your screen with fish. 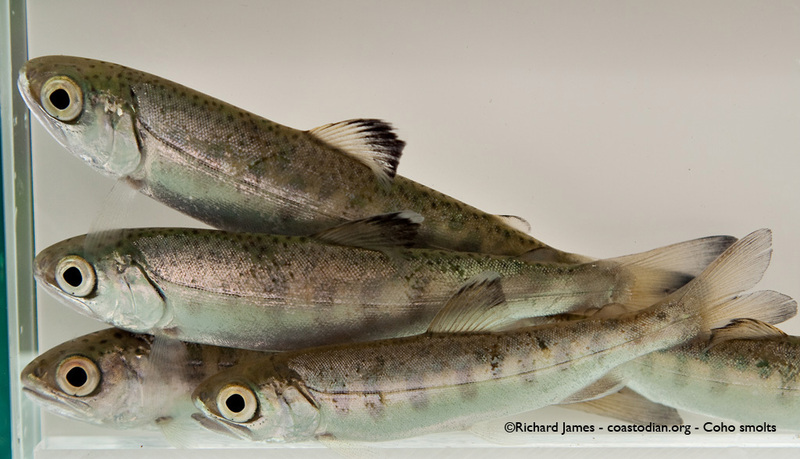 Marin coho salmon and steelhead, do they have value? 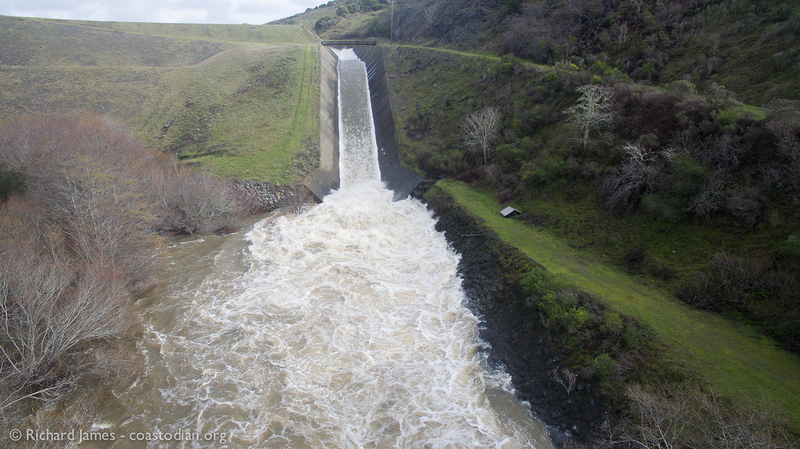 Monitoring, studying and protecting salmon and steelhead are what brought me north to the wild and quirky climes of West Marin. Even before moving here I was observing and recording images of them laying eggs before they die. 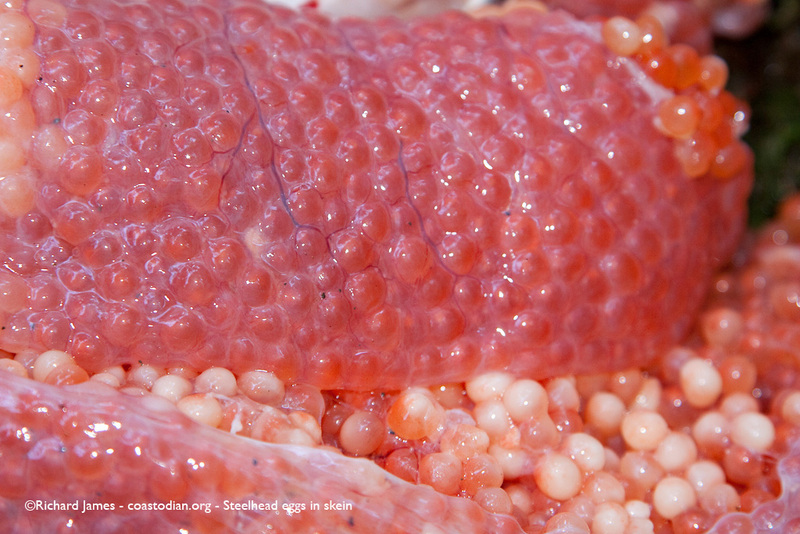 Coho eggs from a female likely killed by a river otter. 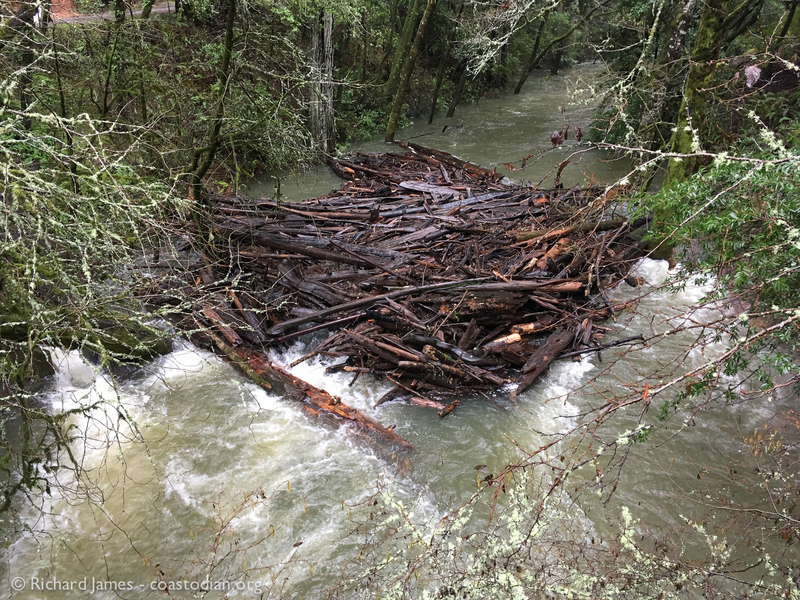 Steelhead eggs still in the skein, Redwood Creek – Muir Woods. 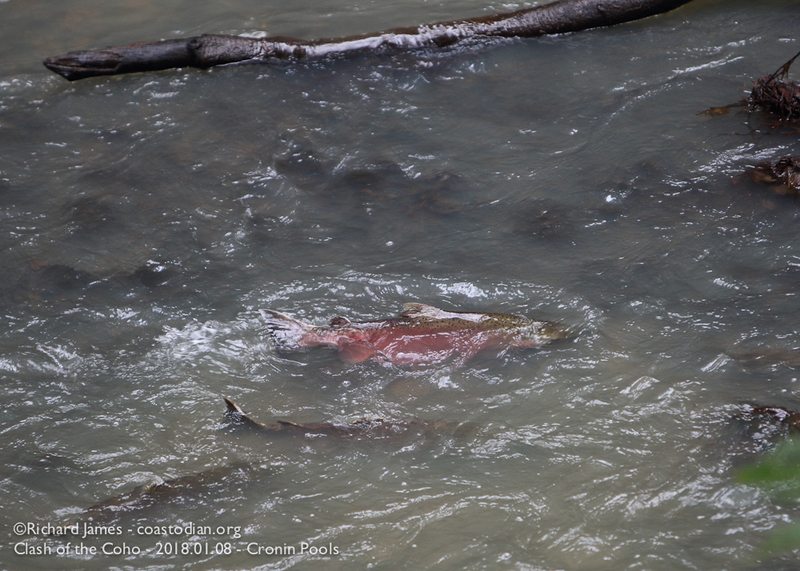 Coho and Steelhead young of the year – Redwood Creek, Muir Woods. Humans care about how big their house is and what “value” it will have when they go to sell it or transfer it to their offspring. I do not know if salmon care. I do know the females expend great effort to find and prepare the right spot to place their future offspring’s embryos. A place whose gravel has not been mined or covered with silt from clear-cut forestry or creek-side development and road-cutting. She seeks a place where the riparian foliage is present and will keep the water cool. The same water that has hopefully not been impounded by a dam, or pumped far and wide to nourish alfalfa or other crops in what historically was a desert. The same water that is, water; not tainted with pesticides, herbicides, plastic softening agents or fire-proofing treatment, for example. We all live in a watershed. Everywhere the rain soaks into the ground, attempting to find the nearest creek or river so it can return to the sea and someday fall as rain once again. 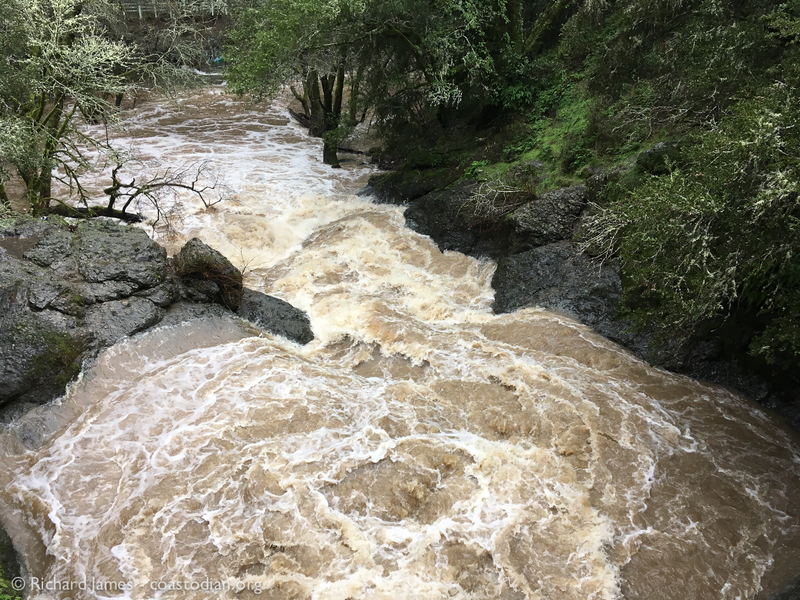 Those that live nearest, or on the creek often complain of the rules being adopted to attempt to slow the decades of damage humans have wrought upon the arteries of the land. Those closest to the banks most directly enjoy the benefits of a healthy creek. 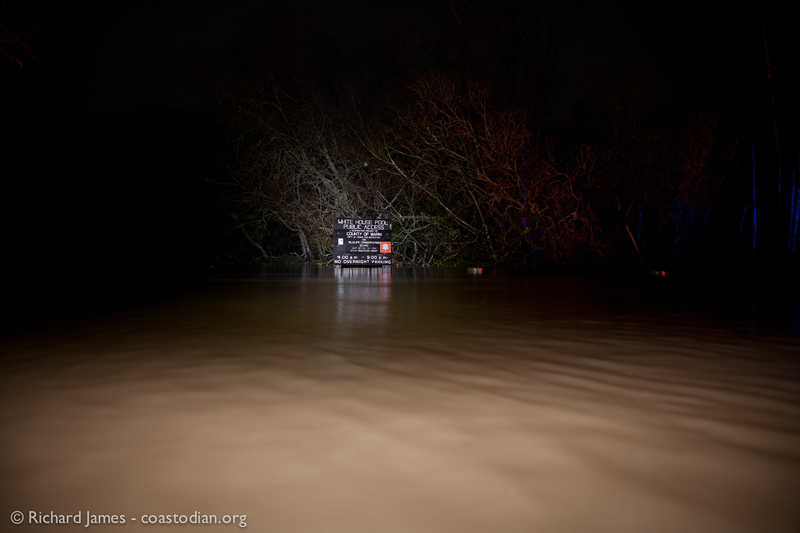 The same that can most directly damage that same creek with ignorant practices. 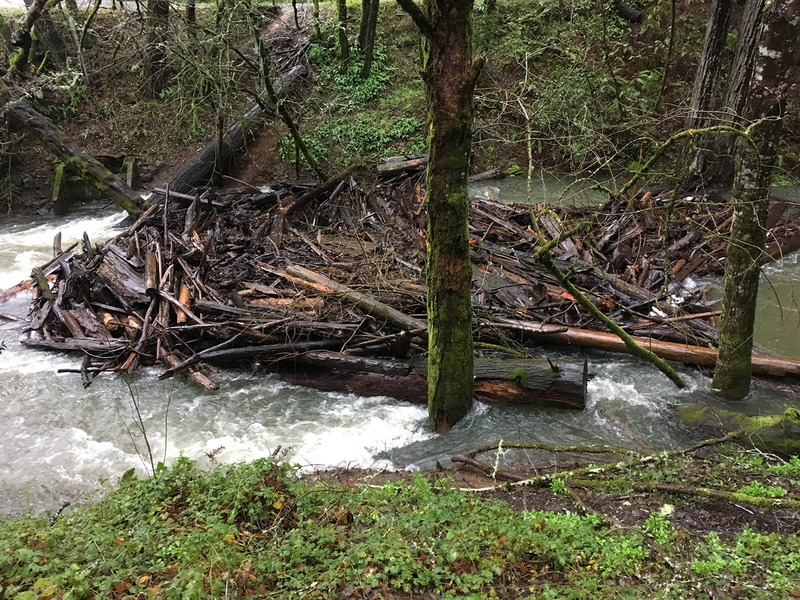 I wonder if the rare and gravid female coho, struggling upstream looking for just the right sized cobbles, the cold, unpolluted water, the woody debris for her and her spawn to hide under, has any sense of what “property values” are? Put another way, How does the value of property compare to the value of not going extinct? Surely we can live simply and within the carrying capacity of this fragile planet so that we are not the last to enjoy her diverse beauty. 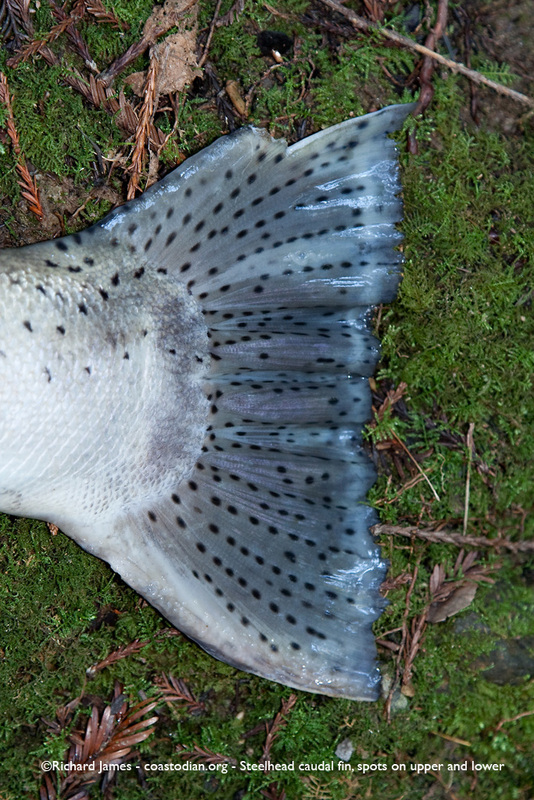 From 2004 through 2010 I assisted the NPS with monitoring of all phases of the salmonid attempt to escape extinction. I learned a great deal about the life-cycle of these gorgeous creatures as I labored alongside a number of gifted and determined professionals. Below are a variety of video clips I have gathered. The first clip is some of the finest spawning footage I have recorded so far and was shown in a previous post. The rest are from previous years. I also include a clip showing rainbow/golden trout hybrids spawning on a high elevation (~11,000 ft ASL) lake in Kings Canyon National Park. I hope you enjoy the fruits of my years of enjoying these fish firsthand. I also hope after watching them in action you’ll be inspired to contribute to their survival so that those that come after us can see and enjoy the offspring of these fish. 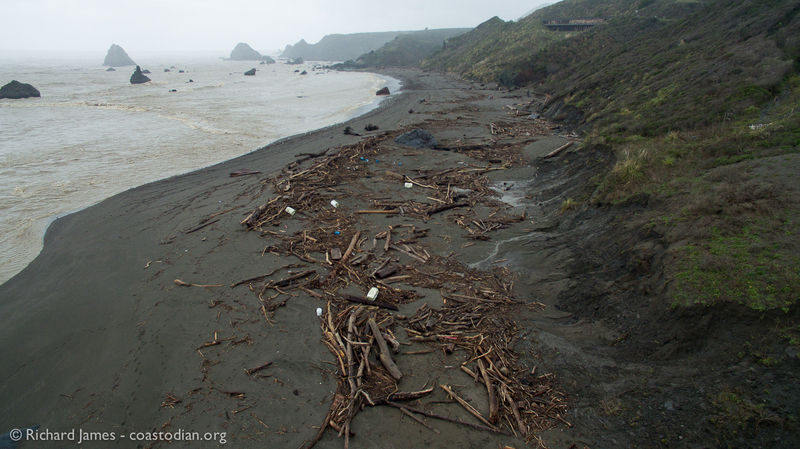 If litter on the beach saddens me, which it does, the return of salmon and steelhead to spawn in our local creeks makes me happy. Coho, party of two your gravel is ready. Coho party of two. Fish that were eggs three years ago are now returning to lay eggs, usually in the very same creek they themselves hatched in. Once this task is done, the fish will linger until they die. This could be a few days or a couple weeks depending on the condition of the fish, the presence of predators as well as water levels. 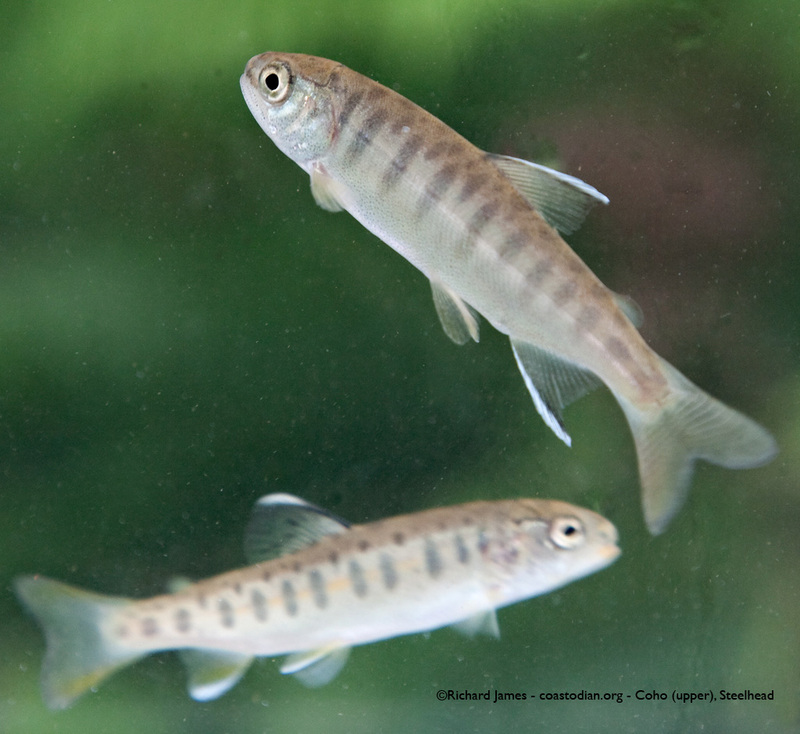 Female coho carry about three thousand eggs. If 2 percent make it to adulthood and spawn 3 years from now, that is considered a huge success. 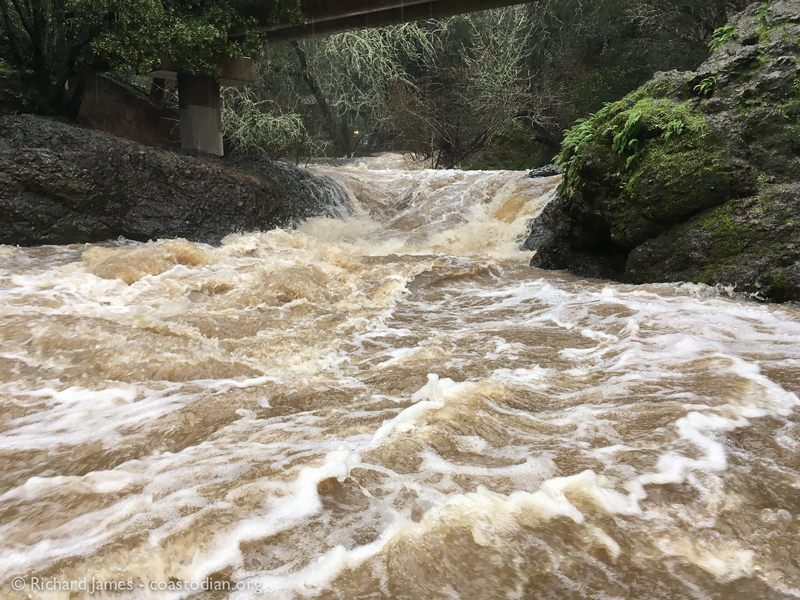 The ten minute video you can watch below was shot on Lagunitas Creek near the Leo Cronin viewing pools in Samuel Taylor Park. I apologize for the intrusive title. I must be doing something right as my work is being used without my permission more and more. Marking it ensures I am credited for my efforts. 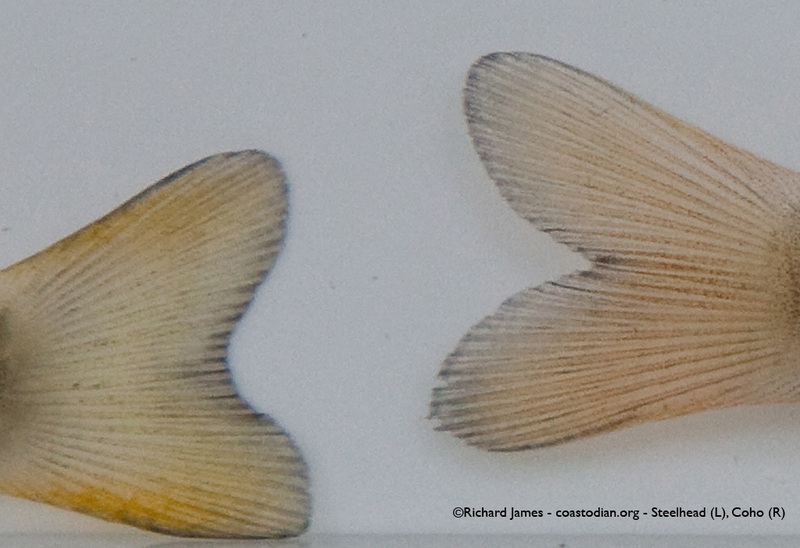 If you’d like to license my work for your use, contact me at info@coastodian.org. Financial support allows me to continue documenting our natural world and hopefully galvanize mindful action to protect it from us. 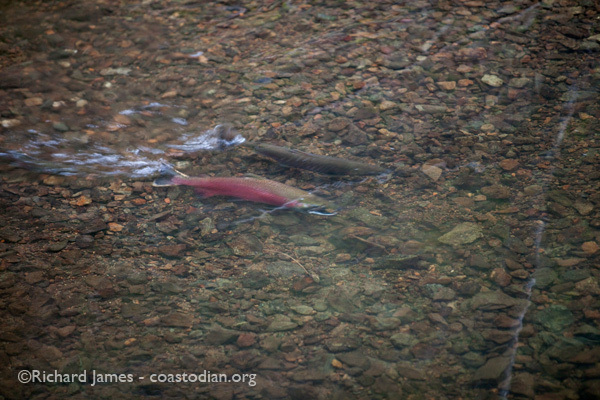 If you want to see spawning salmon in person, now is the time. 1) Quiet. Keep voices down, the fish can hear you and will spook off their redds (nests) if you are too loud. 2) Dress in neutral or darker colors, nothing flashy or bright, they can see you too. 3) Be still. Lots of movement will also scare them off the redd. 4) Bring polarized sun-glasses to cut the glare on the water. Binoculars are good too. 6) Ideally, view fish from just downstream if you can, that way they are less likely to see you and your time to view them will be greater. Click the full screen icon in the lower right corner of the video window and spend some time in nature.